The Samsung Xpress M2875FD mono laser multifunction printer is a powerful printer that offers excellent print results at decent speeds. It has a built-in duplex unit and it offers short wait time, which means better productivity and faster prints. 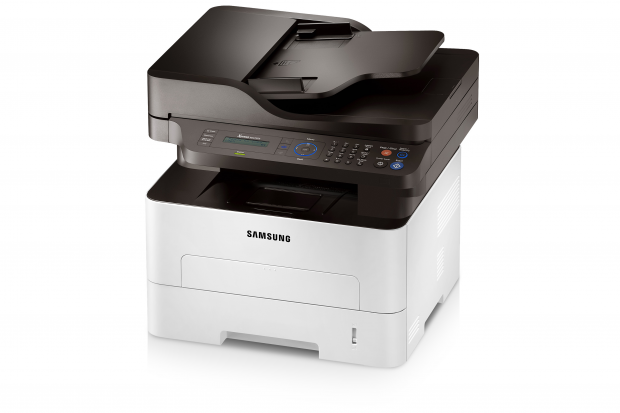 The Samsung Xpress M2875FD printer also offers multifunction capabilities, able to copy, scan, and fax. The Samsung M2875 Xpress multifunction printer does not support colour production, but offers full colour scanning at 4800x4800 dpi. This network ready printer is a good addition to any workgroup, but it is more suitable for basic document production. The Samsung Xpress M2875FD laser multifunction printer is ideal for all round office use, combining four machines into one versatile unit. It measures only about 15.8x14.3x14.4 inches, and weighs nearly 25 pounds. The M2875FD black and white printer is compatible with different operating systems, including Linux and Unix, and it has an impressive duty cycle of up to 12,000 pages. The Samsung Xpress M2875FD monochrome laser printer also offers versatile connectivity, thanks to its built-in USB and Ethernet interfaces, which allow single function and network configuration. Ideal for workgroup use, the Samsung Xpress M2875FD increases productivity, thanks to its fast start-up and impressive print rates, which average 29 pages per minute. The all-in-one Samsung M-2875FD uses budget-friendly consumables, and it can produce high-resolution prints and copies. Fax transmission is also fast at 33.6 kbps, and the unit supports automatic duplexing for convenient double-sided printing. Powerful and yet simple to operate, the Samsung Xpress M2875FD can use a high yield Samsung MLT-D116L black toner cartridge to make running costs more affordable. However, the Xpress M2875FD MFP only supports monochrome printing, copying, and faxing, although it can scan in full colour. The M2875FD printer is bulkier than previous models in the Samsung Xpress series, but the size is still manageable even for desktop use.